The general public says that I should really like all beer made by Founders Brewing Company, well I guess I’m next in line for a public stoning or something, cause I do not like every single beer brewed by this brewery. Rübæus being the least favorite beer I have ever had from Founders. This beer is a Summer beer, being available from May-August, and I did drink this beer back in early September, 2013, so it was still near fresh.. I just slacked off a bit on putting it up on the site. According to the Founders website, this beer is their answer to not being another boring Summer beer like a wheat beer or lemonade shandy. I think maybe, they should have stuck to the normal routine here instead of this beer. Using a Karbach Brewing Hopadillo IPA, this beer poured a deep, clear, burgundy red color with a crown of a pinkish-white soapy head, which retained well and left a good amount of sticky lacing down the glass. This beer had a fantastic appearance. 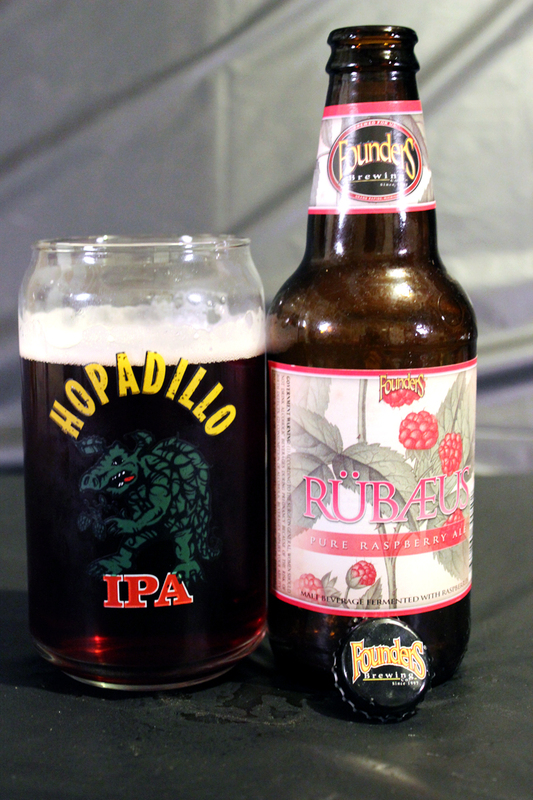 The aroma of Rübæus was all sweet raspberries with not much else coming through at all. There is a faint grain-like smell hiding behind all that fruit, which made this beer smell like a basket of raspberries, down to even the actual basket. It was all sweet, and not a trace of tartness or sourness at all, as I was expecting. The taste was exactly like the aroma. It was all sweet raspberries. Again, there was no trace of tartness or sourness in the taste. Right off the bat, the sweetness hits the tongue and the body, as well is still all sweet raspberries, then at the tail end of the drink the appearance of a grain taste comes through, giving this a quality of what a cheap wood basket would taste like. So this is like a picnic in a bottle, even down to the basket! haha! This beer is a bit thin with little carbonation. The mouthfeel is like a fruit flavored soda or carbonated juice. Overall, I will definitely say that this beer was not one for me. I was not a fan of the pure sweetness of the raspberries with nothing else going on. If this had more sourness, or more of a malty backbone, this beer would have been more enjoyable. Maybe making a more sour version of this beer would be awesome. Until then, I will stay away from this beer, but I am glad I at least tried it. I’m sure your wife or girlfriend will love this, while you drink a more pleasant Founders beer like their Porter or Breakfast Stout. Metal Connection: After seeing the name, Rübæus, I immediately thought of the album title, Transcend the Rubicon by one of England’s most well known Death Metal outfits, Benediction. This album came out in 1993, and features one of my all time favorite Death Metal songs, “I Bow to None,” which I have featured here with this review. I figured I’d let the music redeem this post, since the beer itself was not up to par. So sit back, crank up the volume, and prepare to mosh around your room like a maniac. I Bow to None!!! Yeah bro, in terms of founders, the one beer I could not like was Centennial IPA. Maybe it was a bad batch I tried when I visited a friend from Iowa but …yeah, I am not sure. Well I also wasn’t a huge fan of All Day IPA.